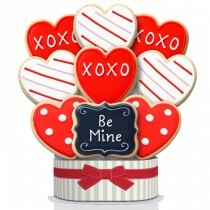 Wow them with our signature Valentine’ Day cookie bouquet featuring a chalkboard-style message cookie nestled among elegantly accented extra large heart-shaped shortbread cookies. Your gift is sure to be a delightful surprise delivered to their door. Choose from a 6 or 9 cookie arrangement. Perfect cookie bouquet for anyone who has stolen your heart! I love that you can send these to anyone even if you don’t live nearby! Imagine the thrill for your grand kids or even for your parents when you send this great cookie gift! As a kid growing up in Syracuse, New York, Tina Corso loved baking cookies. She loved creating art, from selling t-shirts to painting clay pots and, of course, decorating cookies to share with friends and family. Being a smart cookie, Tina decided to open up a small hand-decorated cookie company in 2001 to blend her passion for baking and art into a business. From a humble beginning creating uniquely cool, hand-decorated cookie gifts out of her home, her customers were initially attracted by how beautiful the buttery short bread cookies were decorated, like edible works of art. After tasting them, folks clamored for more and told their friends about Corso’s Cookies. One day in 2008, the original Corso’s Cookies bakery received a call for their largest order to date…an order for 200,000 cookies! And with that a new business was born. A partner to retailers large and small, The Decorated Cookie Company is the premier company for high quality, American made decorated cookies. Made of only the best quality ingredients, our cookies taste as good as they look! Today, The Decorated Cookie Company is the largest manufacturer of decorated cookies in North America. The real secret to our success is our people and the passion for what we do. We are committed to creating cookies that we are proud to share with our own family and friends, remembering that each cookie we make will become a special gift for someone else to share. Our goal is for you to see our passion in every icing detail and taste our passion in every cookie bite.